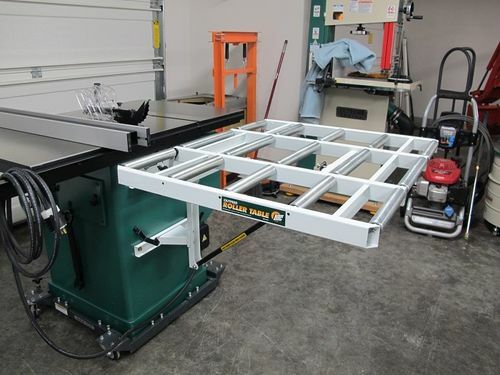 My 3 car garage is limited on space due to multiple machines and the tractor/lawn equipment eating up one whole bay so I decided to go with this fold down roller outfeed table on my new Grizzly 12” G0696X table saw. 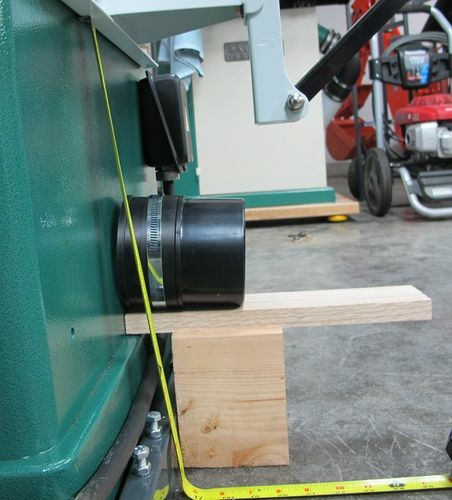 The concept works perfectly for me, its attached to the saw so its mobile, setup takes 5 seconds, love that. Lets take a picture tour and I’ll offer some additional comments. 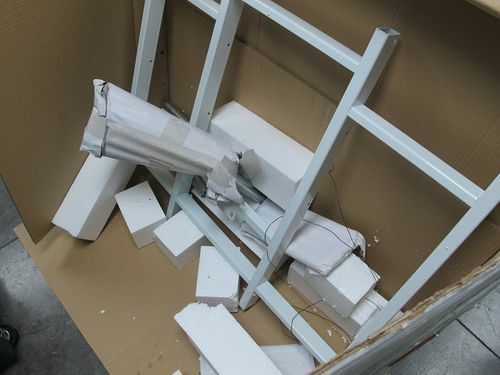 Packing FAIL but thankfully no damage, you can see some of the rollers spilled out into the box. This unit is stout I like that. Not overkill just right so its not too heavy and not too flimsy. Its going to be a compromise between rigidity, weight, foldability, and portability I knew that going in. Here’s the deal on assembly, its ALL about how much effort you want to put into installing and adjusting. There is a certain amount of flex and spring back due to it being steel, the design, and weight. I made ample use of a bottle jack and blocks of wood lifting and preloading to spring back to level. I say level loosely you will never achieve perfection because the rollers are not exactly precision, I adjusted level to their high point. I took extra time positioning the drilling template, loosened and re-tightened the top mounting bolts probably 5 times adjusting. 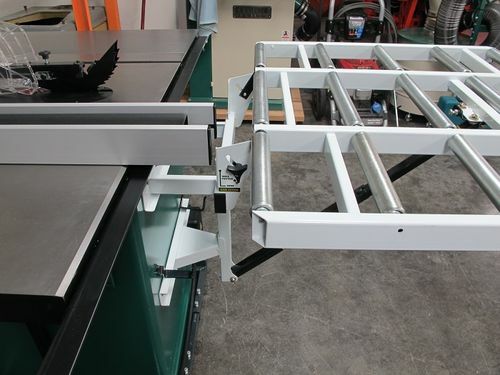 UPDATE 12/30/13 – Something worth noting, with the top mounting bolts snug but still loose enough that you can still adjust it up and down level with the top of the table saw there’s a gotcha, you can dial it in perfect but when you tighten the bolts it will pull the roller table low below the saw table height. 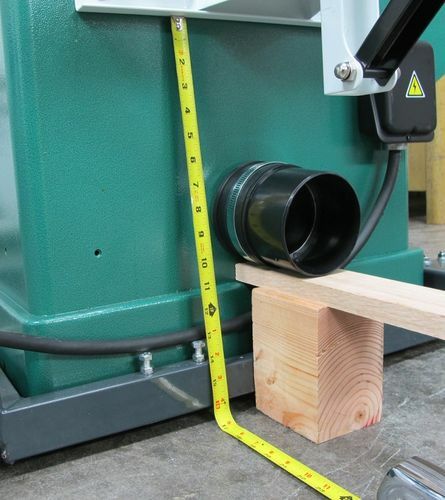 So I had to fit the roller table slightly high, about 1/32 gap or less then tightening the bolts pulled this back to flush with the table saw top. 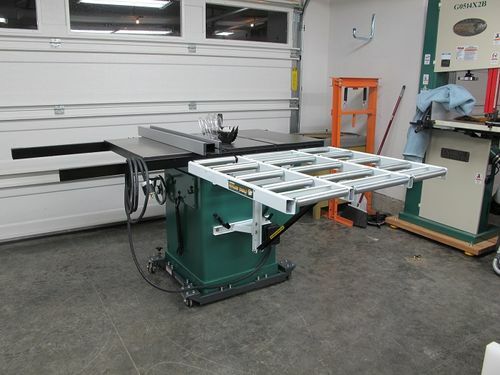 With my Starrett 24” rule (this is an example of when the Starrett 24” rule earns its keep) mostly on the table saw top and extended over the first roller on the outfeed table (per the instructions) there was about a 1/32 gap between my rule and the table saw top at the rear. When I tightened up the top bolts on the outfeed roller table it pulled the roller table down flush with the top of my table saw top. It took a couple of attempts to get this right. 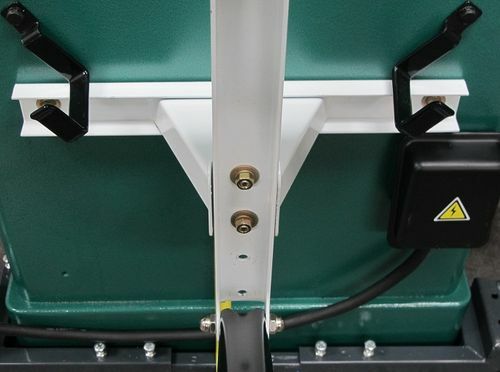 UPDATE 12/30/13 – As noted these rollers are not precision and you can’t pick through the pile of rollers looking for a good pair for the front two outside rollers because they are slightly shorter than the rest of the outside rollers (there’s a reason for this see the instructions). You MUST use those two particular rollers so you are stuck with whatever they give you. I’d guestimate the up/down wobble as .010 to .025. 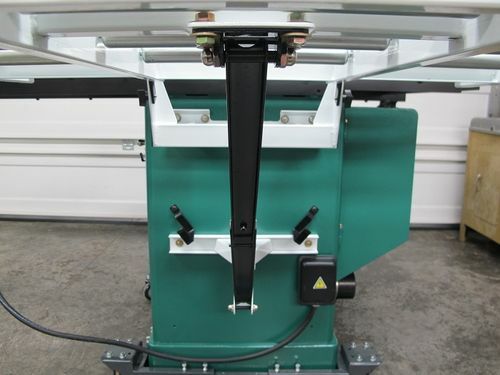 Since I don’t want to be smacking into a roller when ripping I adjusted to the high point on these three front rollers. The install was straight forward enough no problem there. It cleared everything on my saw except the fence brackets that hold the fence when not in use, that’s why they are angled in I’ll add some spacers later and be good to go there. Plenty of clearance for the fence and mine is extra long, its longer than say a Powermatic PM2000 which as the same depth table. Here it is folded down, several inches of floor clearance and fairly compact I like it! Here’s why I took off 1 full point. 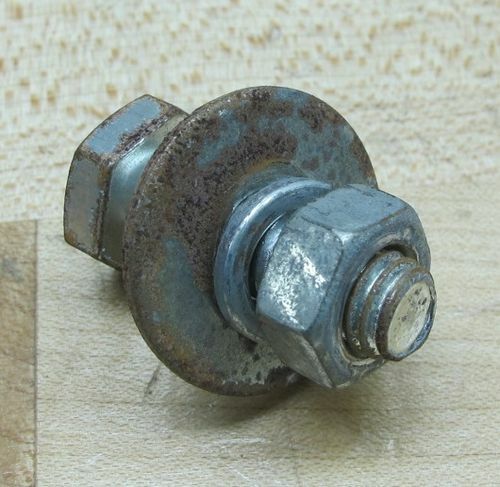 I wasn’t going to ding them for this since I tend to replace supplied fasteners with grade 8 (I have a habit of snapping the cheap factory bolts in half) but NO customer should ever receive a bolt this rusted out of the box what did they soak it in salt water wow! It wasn’t the only one either. Overall I recommend this product just remember its a compromise its not going to be as rigid as a heavy steel cabinet with a cast iron top. 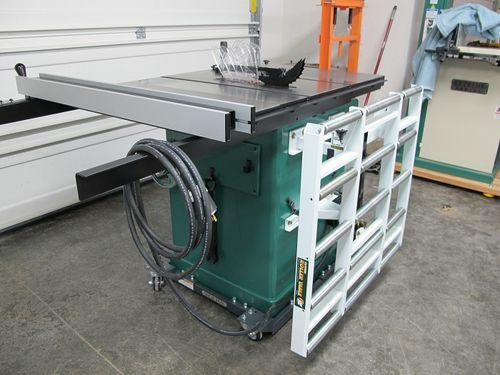 First congrats on your new saw and table. I’m sure you will enjoy it. 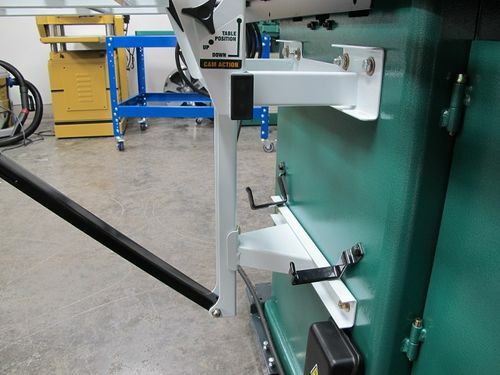 Question…..how far “up” the saw is the bottom knee brace bracket that attaches to the saw? My Generals dust discharge is on the back of the saw and I’m wondering if this will fit it. Nice set up… Well done…. I bought a new Grizzly table saw this summer, and had this outfeed table shipped at the same time. Like you, the box was pretty banged up, but the parts survived. Did not have any rusted hardware. Setting up was easier than I thought it would be, and once in place, I can’t imagine not having it. The difference in ripping long boards or cutting sheets of plywood is amazing. Congratulations on your purchase. Hope you enjoy yours as much as I enjoy mine. Thanks guys, fuzzface its good to hear its working well for you. Dilly here a picture is worth 1,000 words I mocked up a rear 4” dust port for you. You can see here I have used the highest of the 3 mounting positions to clear my electrical box. The instructions say as a last resort you can flip the lower mount upside down to get another inch or so of clearance but I think there’s plenty of room already for a dust port. Guess I better order me of these. Update: 12/28/13 my brother came over yesterday to rip some wood, the roller outfeed table worked quite nicely. I have some long 5/4 oak I’ll be ripping in the near future, I’ll report back again then.